Liam Neeson continues to capitalise on his career hand-break turn into hard-boiled action hero, with this mechanical, shameless cash-in of a sequel, TAKEN 2. Despite being directed competently by the deliciously named Olivier Megaton (TRANSPORTER 3), this movie is really the brain-fart of writer-producer Luc Besson, and betrays all his simplistic sexual and racial politics. As the flick opens, Neeson's super security guard Bryan Mills takes a job in Turkey, after which he is joined by his teenage daughter Kim (Maggie Grace) and his ex-wife-on-whom-he-is-crushing Lenore (Famke Janssen). Ex-husband and wife are soon kidnapped by the vengeful father of the goon Bryan killed in the original movie, leaving Kim alone in the hotel, also prey to hitmen. The first half of the film sees Kim guided improbably by her father to locate and help him escape. The second half sees her safely deposited in the US Embassy and Bryan return to the fray to rescue his ex-wife and do bad things to bad guys. Of course, the story has so many plot holes and improbabilities that one could drive a horse and cart through it. (Not least the fact that as Istanbul is not the capital of Turkey, it doesn't have a US Embassy!) But that's not the point of a movie like this. The point is whether or not you find the chase sequences entertaining and tense. I didn't. They felt derivative and "tab A into slot B". Of course, Liam Neeson is enormously likeable, and we root for him, but this movie really is far tamer and more boring than the original. Moreover, the politically dubious depiction of evil muslim gangsters remains troubling. 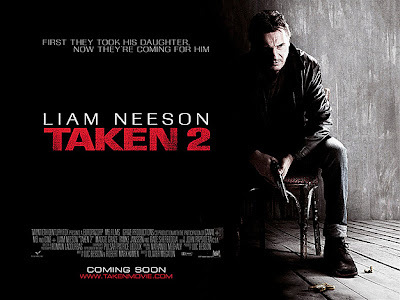 TAKEN 2 is on release in France, Hong Kong, Belgium, France, Switzerland, Argentina, Bahrain, Chile, Croatia, Denmark, Ireland, Israel, Kuwait, the Philippines, Portugal, Russia, Serbia, Singapore and the UK. It opens tomorrow in Brazil, Canada, Colombia, Finland, Iceland, Mexico, Norway, Pakistan, Poland, Sweden, Taiwan, Turkey, the USA and Vietnam. It opens on October 11th in Cambodia, Germany, Greece, Hungary, Italy, New Zealand, Peru, Slovenia; on October 12th in Bulgaria, Estonia, India and South Africa; on October 19th in Panama; on October 26th in Lithuania; on November 22nd in the Netherlands; on December 20th in Macedonia and on January 11th in Japan. TAKEN 2 has a running time of 92 minutes and is rated PG-13.